I haven’t written anything for a while and there’s a good reason! I’ve been on winter break and have taken a complete hiatus from everything — blogging, Twitter, working, studying — to save my sanity. I was beyond stressed out last semester with trying to balance work, school, a social life and traveling, and was incredibly burnt out by the end. To make matters worse, next semester, I’ll be working 37 hours per week (with three, maybe four jobs) on top of five of the hardest classes I’ll be taking in college. So I needed a break. Of course, a break for me doesn’t mean sitting still. I made sure to fit some travel in where I could. Since I’ve been extremely low on money lately, I couldn’t afford to go anywhere international, but I stuck with cool places nearby — New York, Florida and a staycation in Washington, D.C.
First stop was a day trip to New York City with my friend Brian two days before Christmas. It was super spontaneous, given that we decided to go just two days prior, but we wanted to experience New York at Christmastime. On Dec. 23, we woke at the crack of dawn (4 a.m.) to catch our 6:30 Megabus from Union Station in D.C. We got to the city around 11 a.m. and, after some much-needed coffee, headed to Rockefeller Center to see the iconic, 85-foot Christmas tree. Ice-skating at the center was ridiculously overpriced, so we let other people spend $50 to skate and then happily watched them glide and topple on the rink. 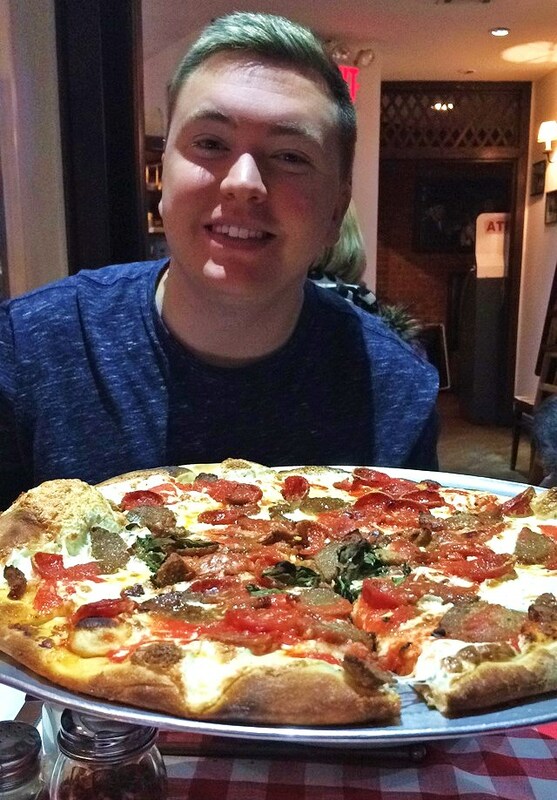 Next we headed to Brooklyn to have our share of world-famous pizza at Grimaldi’s. The wait was horrible. There was no waiting space inside the restaurant, so Brian and I along with maybe 50 other people waited outside in a line stretching down the sidewalk. We shivered from the cold as a slushy rain/snow mix fell from the sky. By the time we got inside we were famished, but of course, the restaurant was so packed that it took at least half an hour to get our pizza. And service was awful; we saw our grumpy waiter only twice; once when we ordered, and once when he delivered the check (which was cash only). But let me tell you, the pizza was delish. We got half pepperoni, half meatball (toppings were a whopping $3 each) and devoured entire large, brick-oven pizza. That being said, the dish was still not exquisite enough to make up for the otherwise unsatisfactory dining experience. I’m glad we went, but I don’t think I’m going to be a repeat customer. The rest of the day was more pleasant. Despite the cold rain, we walked around Brooklyn and got ice cream at the Brooklyn Farmacy and Soda Fountain, an adorable ice cream parlor with great staff that was recently featured on Food Network’s Top Ten Restaurants, a deserving award. Then we walked across the Brooklyn Bridge for the first time, and went to meet some of Brian’s friends for dinner in the West Village. The bridge was more stunning than I imagined. The long wires that stretched from the center of the bridge down to the entryways created a web-like network that was intimidating but beautiful. The lights from the cars driving below added an interesting illumination that just added to the overall aura of the bridge. And, of course, the view of the New York skyline from the peak of the bridge looked just as it does in the photos. Later, during dinner, one of my friends from school saw something I had posted online about being in West Village and messaged me saying she was at a jazz bar just down the street! What a coinkydink! So Brian and I parted ways with his friends after dinner and went to meet my friend Lily at the Fat Cat Jazz Bar. Luckily the bar was 18+, so Brian, who is 19, could get in. I grabbed a cider from the bar and Brian and I joined Lily and her friends at a table where we talked, played games, and listened to the jazz musicians jam. But soon it was nearly 11 p.m. and Brian and I had to make it back to the pickup stop to catch our midnight bus back to D.C. It was a long, tiring day, but an absolute blast. We were zonked by the time we got back to Union Station at 6 a.m. Christmas Eve and headed home quickly. But I had work at 10 a.m., so I only got a few hours of sleep before I had to fire up the engines again (go figure). But totally, totally worth it. I love your blog. What an inspiring and mouth-watering post! Hey there! Thanks so, so much! And best of luck with yours! Yeah, the pizza was wonderful… but the service, not so much.